The National Air Force Museum of Canada (NAFMC), in association with the Atlantic Canada Aviation Museum (ACAM) in Halifax, and with the assistance and generosity of the Reynolds Museum Ltd., is restoring a 1942 Mark VI Lockheed Hudson, Serial Number FK466. The NAFMC started work on this demanding project in October 2010. When restored, FK466 will represent a significant aircraft in the history of Canada’s Air Force and it will be the only Mark VI Hudson on display in the world. FK466 is not a complete aircraft, as it was cut up upon disposal from “War Assets” after WWII, and it requires numerous items including interior furnishings, cockpit instruments and engines. In addition, finding manufacturer’s drawings and blueprints is another priority for the Restoration Workshop team. Restoration time for FK466 is estimated at five to ten years to complete. 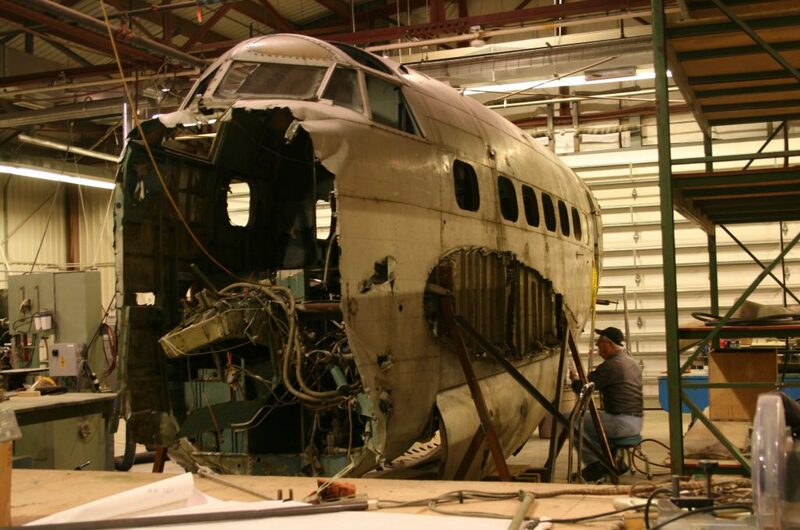 Restoration of the Hudson is on hold, waiting for Pratt & Whitney 1830-69 radial engine mounts and cockpit instruments. The Lockheed Hudson was an American-built light bomber and coastal reconnaissance aircraft built initially for the Royal Air Force (RAF) shortly before the outbreak of the Second World War and primarily operated by the RAF thereafter. The Hudson served throughout the war, mainly with Coastal Command, but also in transport and training roles, as well as delivering agents into occupied France. They were also used extensively with the Royal Canadian Air Force’s (RCAF) anti-submarine squadrons. By February 1939, RAF Hudsons began to be delivered to No. 224 Squadron RAF at RAF Leuchars, Scotland. By the start of the war in September, 78 Hudsons were in service. Due to the United States then-neutrality, early series aircraft were flown to the Canadian border, landed, and then towed on their wheels over the border into Canada by tractors or horse-drawn teams, before then being flown to RCAF airfields where they were then dismantled and “cocooned” for transport as deck cargo, by ship to Liverpool. Although later outclassed by larger bombers, such as the Halifax and the Lancaster, the Hudson achieved some significant feats during the first half of the war. On 8 October 1939, over Jutland, a Hudson became the first RAF aircraft to shoot down a German aircraft. They also operated as fighters during the Battle of Dunkirk. 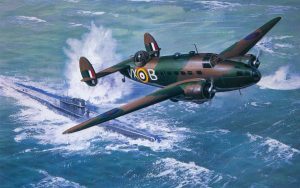 A Hudson of RCAF Bomber Reconnaissance Squadron 113 became the first aircraft of the RCAF’s Eastern Air Command to sink a submarine, when Hudson 625 sank U-754 on 31 July 1942. In all, a total of 2,584 Hudsons were built. They began to be withdrawn from front-line service in 1944. 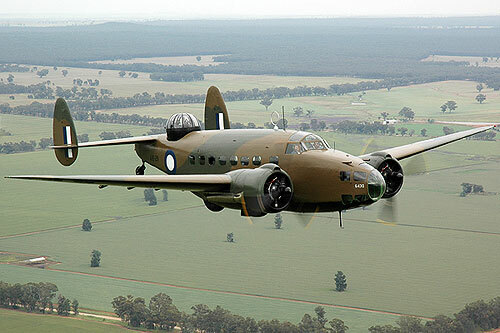 Some Hudsons were converted to civil transports after the war, and the Hudson formed the basis for the development of the Lockheed Ventura. It is a Lockheed Hudson Mk. VI, with Royal Air Force (RAF) Serial Number FK466, and it was built at Burbank, California, in September 1942. It was a Lend-Lease aircraft, and it was part of one of the last batches of Lend-Lease Hudsons. The Hudson was equivalent to the USAAF Model A-28A. FK466 was ferried from Burbank, California, to Eastern Air Command at RCAF Station Debert, Nova Scotia, on October 5, 1942. It was first assigned to No. 31 (RAF) Operational Training Unit (OTU) at RCAF Station Debert, a formation of the BCATP. While at No. 31 (RAF) OTU, FK466 was used to train crews to ferry Hudsons to England and for the Maritime Patrol role. On August 8, 1944, FK466 was then transferred from the BCATP to the War Materials Office as “War Reserve,” at No. 21 Repair Depot, Moncton, New Brunswick, pending modification to Air Sea Rescue (ASR) configuration. to the ASR role. FK466 was now attached to No. 1 (Composite) Squadron based at RCAF Station Torbay, Newfoundland. No. 1 Composite Squadron had been formed to provide target towing, search and rescue, and communications duties as part of Eastern Air Command. No. 1 Composite Squadron’s diary indicates that on April 17, 1945, Flying Officer (F/O) McKay dropped a dummy lifeboat from FK466 over Quidi Vidi Lake, near St. John’s, Newfoundland. The Air Sea Rescue element of the squadron, which included FK466 and other aircraft and personnel, was transferred to the control of RCAF Station Torbay, when No. 1 Composite Squadron was disbanded on July 7, 1945. The Air Sea Rescue Flight operated for about two months using Hudsons FK466 and FK495. The lifeboat system was utilized on July 6, 1945, when an Airborne Lifeboat was lowered to the crew of a B-24D Liberator from RCAF #10 Squadron, Tail Number 595, which had ditched in the Atlantic off Newfoundland, after experiencing flight control problems. Whether FK466 or FK 495 carried out the lifeboat drop is currently unclear, but we are working on that mystery. No. 1 Reconnaissance and Navigation School was moved to RCAF Station Greenwood, Nova Scotia on December 15, 1945. FK466 was utilized by “Station Flight” at RCAF Station Greenwood for general transport duties until September 9, 1947, when it was placed on Aircraft Pending Disposal At Location (APDAL) at RCAF Station Greenwood, and then transferred to War Assets on November 10, 1947. The contribution of our dedicated volunteers in the restoration and preservation of our aircraft cannot be overstated. Our volunteers come from all walks of life and most are retired from their previous careers. We are also very fortunate to have a volunteer who was not only a Hudson pilot during the WWII, but he also flew this very aircraft! 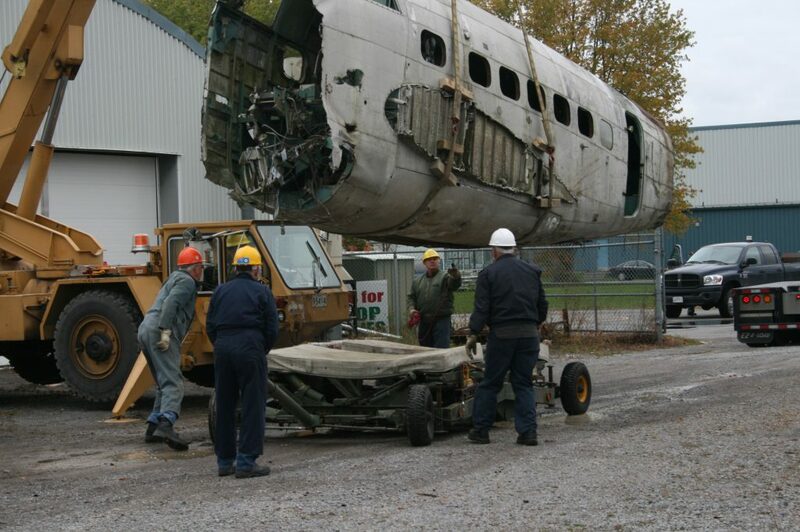 Anyone who is interested in volunteering as a member of the Restoration Workshop Crew (especially persons with metal work experience), or having additional information or details about these aircraft or the bases or squadrons that form part of their history, is encouraged to contact the National Air Force Museum of Canada directly at (613) 965-2864 or by email to: restoration@airforcemuseum.ca attention: Hudson Restoration.